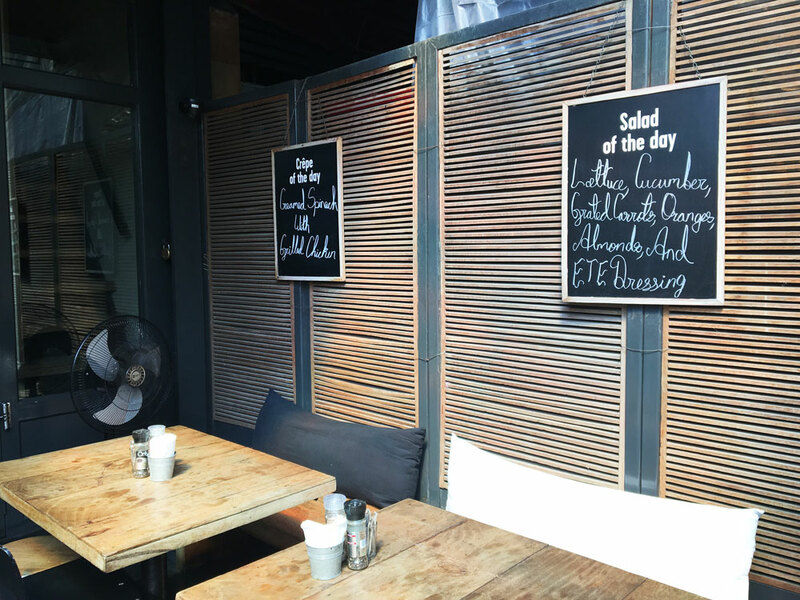 A perfect halt for delicious crêpes and coffee in the heart of Bandra’s Pali Hill. 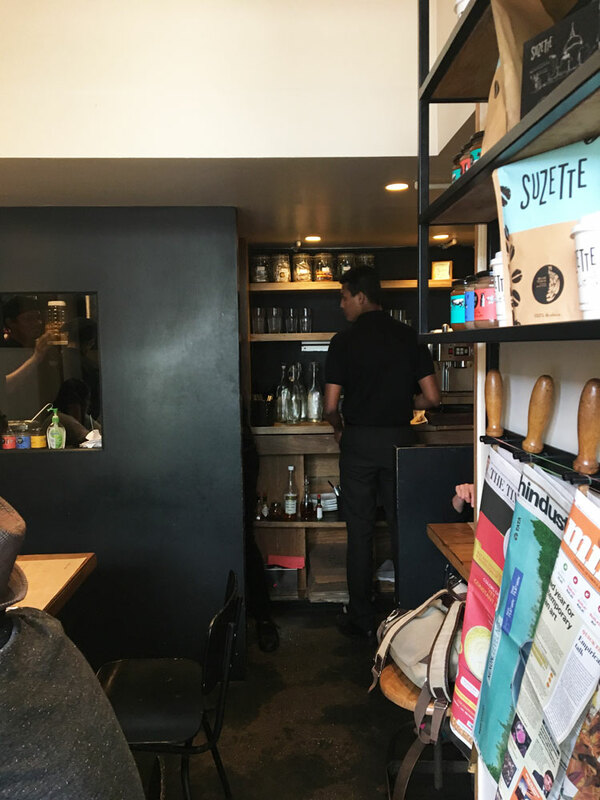 The cozy space ensures you’ll be rubbing elbows with the person at the next table, so best hope they’re interesting conversationalists. 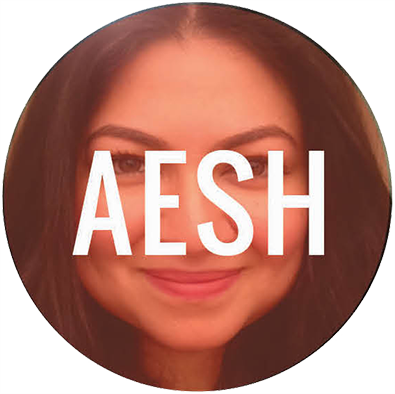 Our hostess and most knowledgable advisor. 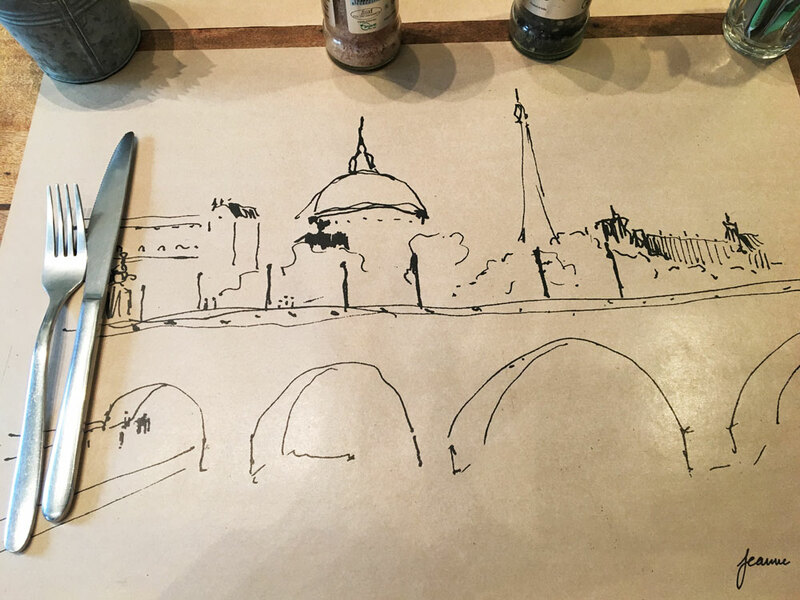 As we sat, we were greeted with lovely brown paper placemats with a hand drawn sketch of the seaside town of Brittany in France. 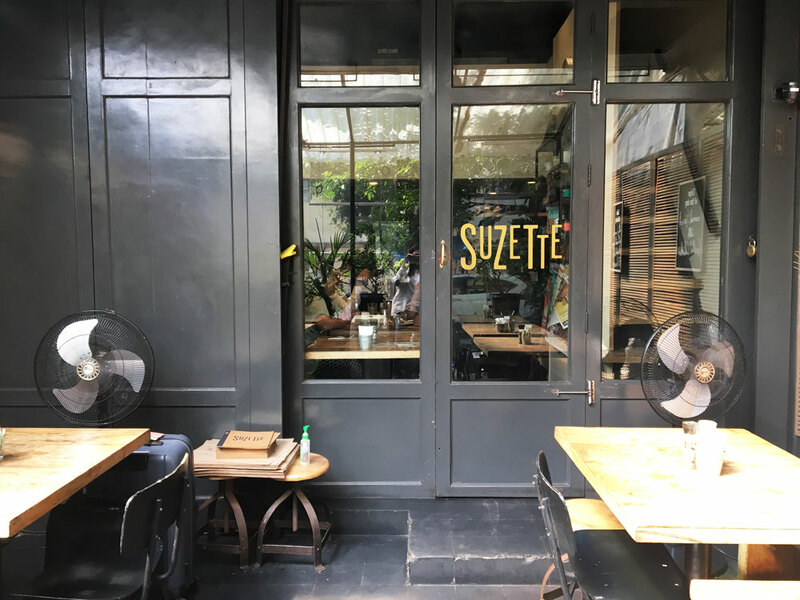 This is where the Suzette crêpe recipe originates from. 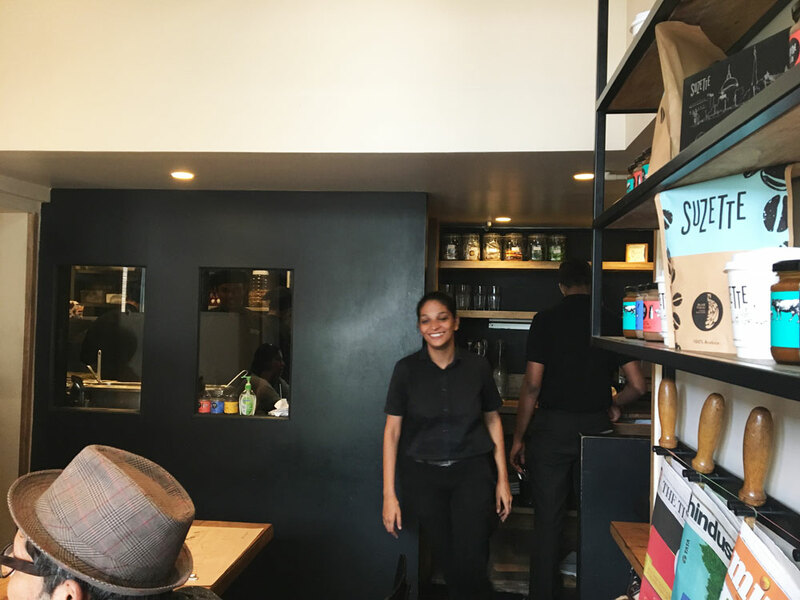 A peek into the kitchen, a lesson in getting the most utility out of a tiny space. 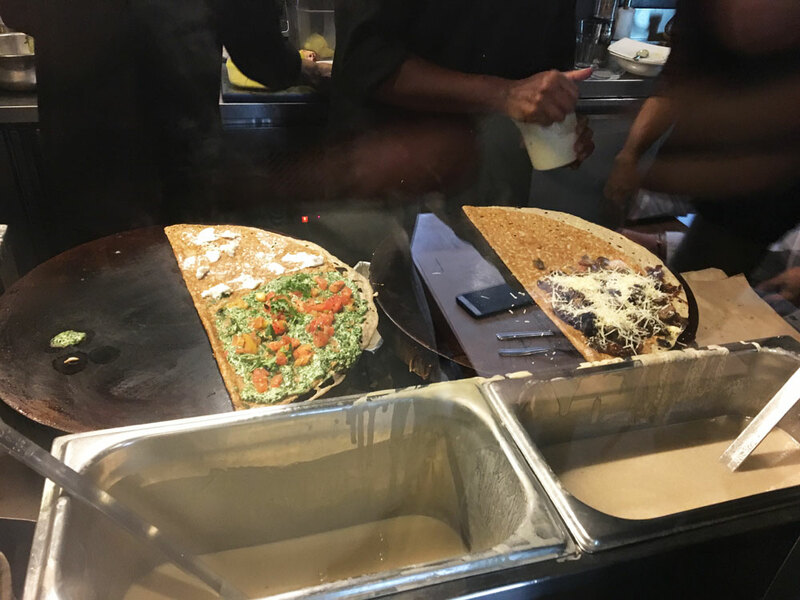 Our crêpes being made, the ‘Italie’ on the left with basil pesto, sun-dried and fresh tomatoes, rocket leaves, and mozzarella. 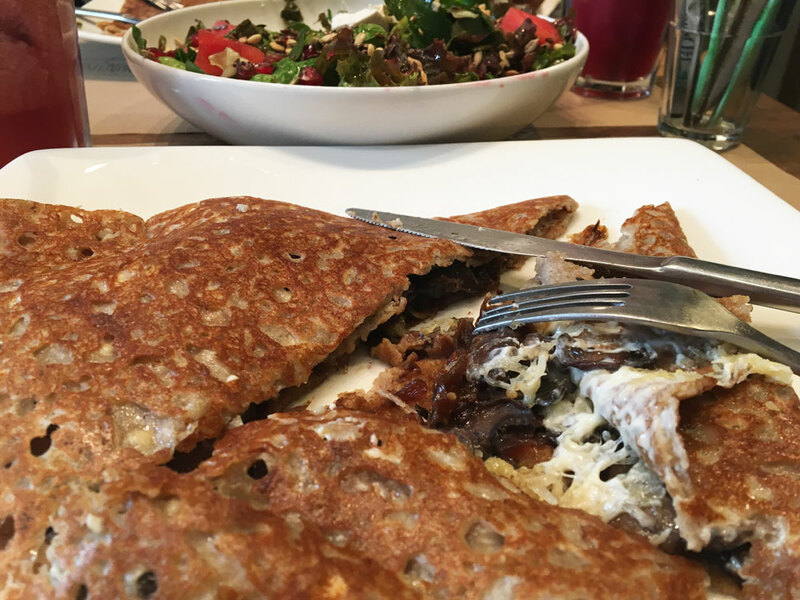 The crêpe on the right is the newly introduced ‘Champignon’, with a filling of sautéed mushrooms, caramelised onions, mascarpone, and parmesan. 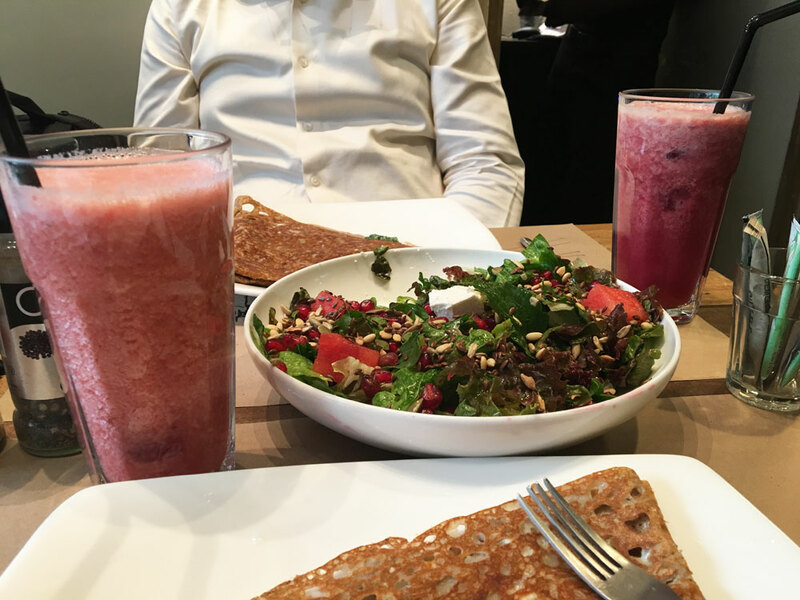 Since we were in for some heavy carb-loading, we started the meal with a Pasteque salad. 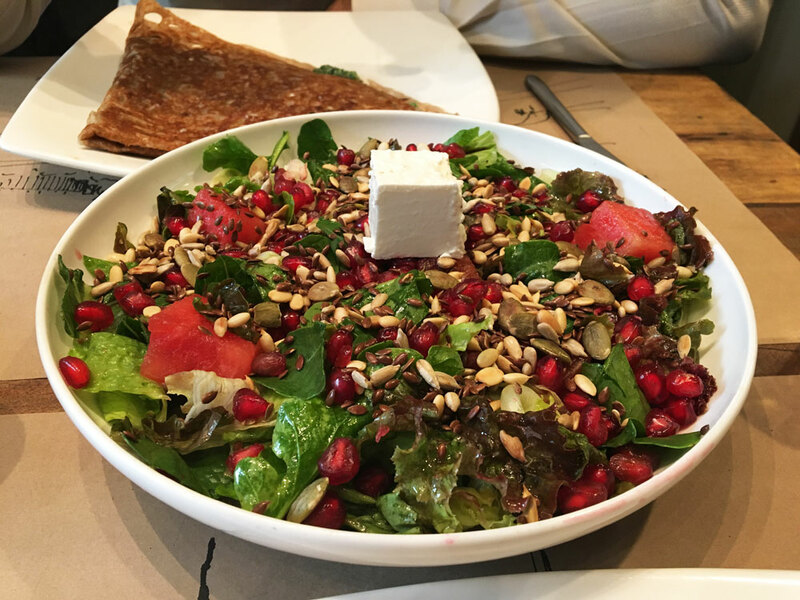 It was a beautiful combination of rocket leaves, feta cheese, watermelon, pomegranate, pistachios and mixed seeds. Raspberry, apple and pineapple juice. No sugar added thankfully. Get a load of that cheesy action. 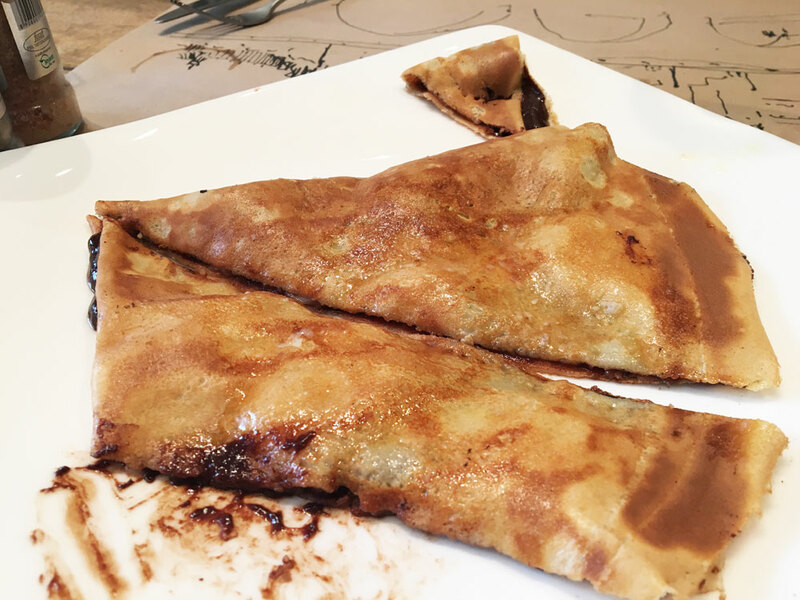 The batter for these crepes is made of buckwheat, which gives them that distinct texture and bite. Dessert time, because it’s a crêperie. And it’s not really a crêpe unless it has dark chocolate and bananas in it. 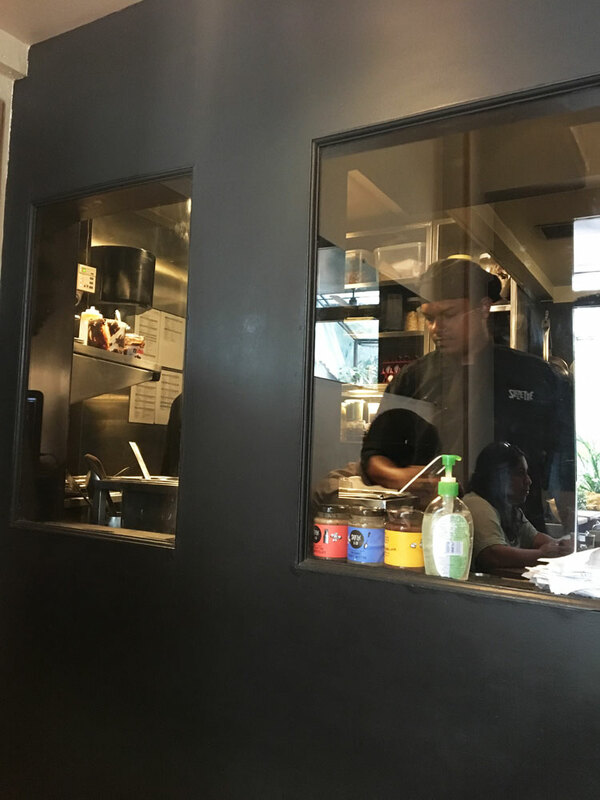 Delicious crêpes, and great service. This wall of takeaway goodies is definitely a good idea. 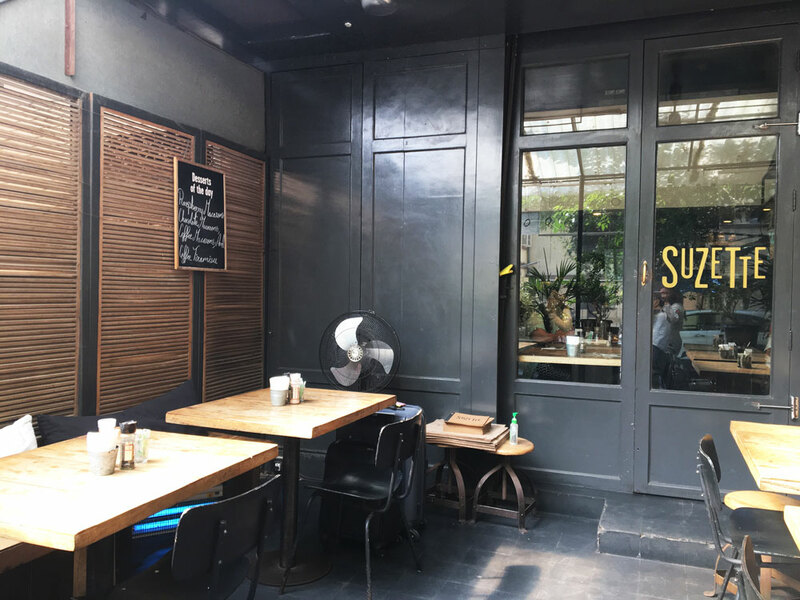 Suzette Crêperie and Café, near Gold’s Gym, St. John Street, Pali Hill, Bandra West. Open 9am to 10:30pm. Call them at 022 26411431.